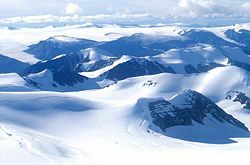 The Arctic Cordillera, sometimes called the Arctic Rockies, is a vast deeply dissected mountain system, running along the northeastern shore of North America, extending southeast from Ellesmere Island and covering most of the eastern coast of Nunavut, a distance of well over 621 miles (1,000 km). The mountain system covers much of the Canadian Arctic Archipelago with high glaciated peaks rising through icefields and some of Canada's largest ice caps, such as the Penny Ice Cap on Baffin Island. It is bounded to the east by Baffin Bay, Davis Strait and the Labrador Sea while its northern portion is bounded by the Arctic Ocean. The physical geography of the mountain system is stunning, with breathtaking scenery and enchanting wildlife. Due to the lack of industrialization, the Arctic air is among the clearest on Earth. Though much of the area is ice or snow covered, the vegetation of its snow-free areas supports musk oxen, caribou and polar bears, as well as the Arctic Hare and birds such as the majestic Artic Tern. The Arctic Cordillera range is mostly located in Nunavut but extends southeast into the northernmost tip of Labrador and northeastern Quebec. The system is divided into a series of ranges, with mountains reaching heights of more than 2,000 m (6,562 ft). The highest of the group is Barbeau Peak on Ellesmere Island at 2,616 m (8,583 ft), which is the highest point in eastern North America (if one defines North America as Canada and the United States). The system is also one of Canada's two major mountain systems, the other being the Rocky Mountains of Western Canada. Some of Canada's highest but least known peaks are found within the group, which offer some of the world's most spectacular scenery. 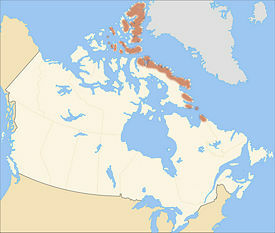 The Arctic Cordillera is a narrow ecozone compared to other Canadian ecozones. The majority of this zone borders the Northern Arctic, while the small segment within Labrador borders the Taiga Shield. However, bordering the Taiga Shield seems to affect neither itself nor the ecozones it borders because their biological properties appear to be opposites (cold climate versus warm climate; different species of plants and animals). While the Arctic Cordillera mountain system includes most of the Arctic islands and regions such as Bathurst Island, Cornwall Island, Amund Ringnes, Ellef Ringnes, Ellesmere Island, Baffin Island, Bylot Island and Labrador, the Arctic Cordillera ecozone only covers Ellesmere Island, Baffin Island, Axel Heiberg Island, Bylot Island and Labrador. The term cordillera refers to several different regions associated with the mountain range. Most broadly, it refers to the entire mountain range with high-altitude mountains overlooking the jagged peaks and ridges, though some flat-topped mountains exist. The term comes from the Spanish word cordilla, which is a diminutive of cuerda, or "cord." The term Arctic Rockies is sometimes used to express the Arctic Cordillera's similarity to the more well-known Rocky Mountains of Western Canada. The Arctic Cordillera contains numerous regions. 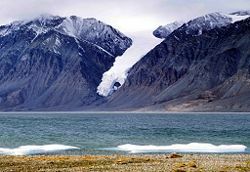 Much of Ellesmere Island is covered by the Arctic Cordillera, making it the most mountainous in the Canadian Arctic Archipelago. It is considered part of the Queen Elizabeth Islands, with Cape Columbia being the most northerly point of land in Canada. It encompasses an area of 196,235 km² (75,767 sq mi), making it the world's tenth largest island and Canada's third largest island. The first inhabitants of Ellesmere Island were small bands of Inuit drawn to the area for Peary Caribou, muskox, and marine mammal hunting about 1000-2000 B.C.E. Axel Heiberg Island is one of the several members of the Canadian Arctic Archipelago and the largest of the Sverdrup Islands. It has been inhabited in the past by Inuit people, but was uninhabited by the time it was named by Otto Sverdrup, who explored it around 1900. In 1959, scientists from McGill University explored Expedition Fiord in central Axel Heiberg Island. This resulted in the establishment of the McGill Arctic Research Station, constructed 8 km (5 mi) inland from Expedition Fjord in 1960. Baffin Island is the largest island in Canada and the fifth largest island in the world, with an area of 507,451 km² (195,928 sq mi). 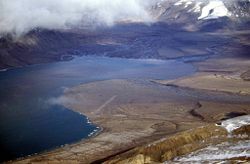 The largest uninhabited island on Earth, Devon Island is the second-largest of the Queen Elizabeth Islands, the 27th largest island in the world and Canada's 6th largest island. An outpost was established at Dundas Harbour in August 1924 as part of a government presence intended to curb foreign whaling and other activity. Much of Bylot Island is covered by the Arctic Cordillera. At 11,067 km² (4,273 sq mi) it is ranked 71st largest island in the world and Canada's 17th largest island. While there are no permanent settlements on this island, Inuit from Pond Inlet and elsewhere regularly travel to Bylot Island. 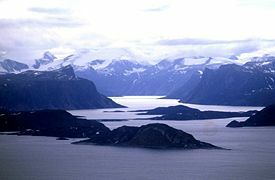 More than one-fifth of Ellesmere Island is protected as Quttinirpaaq National Park (formerly Ellesmere Island National Park), which includes seven fjords and a variety of glaciers, as well as Lake Hazen, the world's largest lake north of the Arctic Circle. Barbeau Peak, the highest mountain in Nunavut (2,616 m, 8,593 ft) is located in the British Empire Range on Ellesmere Island. The most northern mountain range in the world, the Challenger Mountains is located in the northwest region of the island. The northern lobe of the island is called Grant Land. In July 2007, a study noted the disappearance of habitat for waterfowl, invertebrates, and algae on Ellesmere Island. According to John P. Smol of Queens University in Kingston, Ontario, and Marianne S. V. Douglas of the University of Alberta in Edmonton, warming conditions and evaporation have caused low water levels changes in the chemistry of ponds and wetlands in the area. The researchers noted that "In the 1980s they often needed to wear hip waders to make their way to the ponds… while by 2006 the same areas were dry enough to burn. Sirmilik National Park in northern Baffin Island harbors large populations of thick-billed murres, Black-legged Kittiwakes and greater snow geese. The park comprises three areas, Bylot Island, Oliver Sound and the Borden Peninsula. 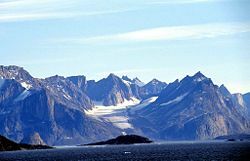 The Auyuittuq National Park located on Baffin Island's Cumberland Peninsula, features the many terrains of Arctic wilderness, such as fjords, glaciers, and ice fields. In Inuktitut - the language of Nunavut's Aboriginal people, Inuit - Auyuittuq means "the land that never melts." Although Auyuittuq was established in 1976 as a national park reserve, it was upgraded to a full national park in 2000. Well known peaks in the park include Mount Asgard and Mount Thor with a 1,250 meter (4,100 ft), 105° face. The Torngat Mountains National Park Reserve located on the Labrador Peninsula, covers much of the southern end of the Arctic Cordillera. It protects much of the Arctic wilderness, such as caribou, polar bears, peregrine falcon and the golden eagle. The park was first established on January 22, 2005, making it the first national park to be created in Labrador. 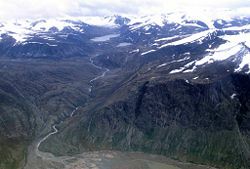 The drier northern section of the Arctic Cordillera is largely covered with ice caps while glaciers are more common at the more humid southern end. Large portions of Ellesmere Island are covered with glaciers and ice, with Manson Icefield and Sydkap in the south; Prince of Wales Icefield and Agassiz Ice Cap along the central-east side of the island, along with substantial ice cover in Northern Ellesmere Island. The northwest coast of Ellesmere was covered by a massive, 500 km (300 mi) long ice shelf until the twentieth century. The Ellesmere ice shelf reduced by 90 percent in the twentieth century due to global warming, leaving the separate Alfred Ernest, Ayles, Milne, Ward Hunt, and Markham Ice Shelves. A 1986 survey of Canadian ice shelves found that 48 square kilometres (19 sq mi) (3.3 km³, 0.8 cu mi) of ice calved from the Milne and Ayles ice shelves between 1959 and 1974. The Ward Hunt Ice Shelf, the largest remaining section of thick (>10 m, >30 ft) landfast sea ice along the northern coastline of Ellesmere Island, lost 600 km (370 mi) of ice in a massive calving in 1961-1962. It further decreased by 27 percent in thickness (13 m, 43 ft) between 1967 and 1999. The breakup of the Ellesmere ice shelves has continued in the twenty-first century: the Ward Ice Shelf experienced a major breakup during summer 2002; the Ayles Ice Shelf calved entirely on August 13, 2005; the largest breakoff of the ice shelf in 25 years, it may pose a threat to the oil industry in the Beaufort Sea. The piece is 66 square kilometres (25 sq mi). The Barnes icecap is found in the central part of the Baffin Island and it has been in retreat since at least the early 1960s when the Geographical Branch of the then Department of Mines & Technical Surveys sent a three-man survey team to the area to measure isostatic rebound and cross-valley features of the Isortoq River. The northern portion of the Arctic Cordillera was uplifted during the Innuitian orogeny when the North American Plate moved northward during the mid Mesozoic. It contains igneous and metamorphic rocks, but for the most part is composed of sedimentary rocks. Mountains on Axel Heiberg Island consist mainly of long ridges of folded mid Mesozoic and Palaeozoic strata with minor igneous intrusions. The Arctic Cordillera is younger than the Appalachians, and so erosion has not had time to reduce it to rounded hills. The mountains are also barren because trees can neither survive the extremely cold winter temperatures, nor grow during the short summers. Vast areas are covered by permanent ice and snow. The Arctic Cordillera resembles the Appalachians in composition and contain similar types of minerals. The mineral resources have not been greatly exploited, however, because the region's remote location makes development too costly when cheaper alternatives exist further south. Mountains on southeastern Ellesmere Island are principally made of granitic gneiss, migmatic, undifferentiated intrusive and volcanic rocks. They are typified by being highly eroded, with conspicuous deep vertical fissures and narrow ledges. The Arctic Cordillera form the eastern edge of the Canadian Shield, which covers much of Canada's landscape. Precambrian rock is the major component of the bedrock. Mountains of volcanic rock range in age from 1.2 billion to 65 million years old. The Late Cretaceous Ellesmere Island Volcanics has been uncertainly associated to both the early volcanic activity of the Iceland hotspot and the Alpha Ridge. Even though these volcanics are about 90 million years old, the volcanoes and cinder are still visible. The Late Cretaceous Strand Fiord Formation is interpreted to represent the cratonward extension of the Alpha Ridge, a volcanic ridge that was active during the formation of the Amerasian Basin. The formation is part of the thick Sverdrup Basin succession and immediately precedes the final basin foundering event. 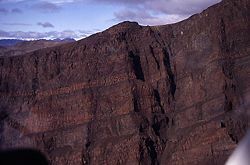 The Strand Fiord volcanics are encased in marine strata and thin southward from a maximum thickness of 789+ m on northwestern Axel Heiberg to a zero edge near the southern shore of the island. Tholeiitic icelandite basalt flows are the main constituent of the formation with pyroclastic conglomerates, sandstones, mudrocks and rare coal seams are also present. The lava flows range in thickness from 6 to 60 m and subaerial flows predominate. Both pahoehoe and aa lava types are common and the volcanic pile accumulated mostly by the quiet effusion of lavas. The pyroclastic lithologies become more common near the southern and eastern edges of the formation and represent lahars and beach to shallow marine reworked deposits. The formation contains flood basalts which are found on western Axel Heiberg Island at Dragon Cliffs 300 meters tall. It contains columnar jointing units that are usually 1 to 3 meters in diameter. The Bravo Lake Formation in central Baffin Island is a rare alkaline-suite that formed as a result of submarine rifting during the Paleoproterozoic period. The lavas of the volcanic belt display geochemical characteristics similar to modern ocean-island-basalt groups. The range from moderately to intensely fractionated REE-profiles is similar to that from tholeiitic basalts to extremely alkaline lavas in Hawaii. Male polar bear climbing ice floe in Ukkusiksalik National Park, Nunavut. Little grows in this severe environment, where killing frost can come at any time during the year and even soil is rare. Three-quarters of the land is bare rock; and even lichen have a hard time of it. Trees are hardly noticeable. Plants that do grow in the region are mostly tiny species that often grow in thick isolating mats to protect themselves from the cold or are covered in thick hairs that help to insulate and to protect them from the harsh wind. Some of the plant species found are arctic black spruce, arctic willow, cottongrass, kobresia, moss species, wood rush, wire rush, purple saxifrage, Dryas species, sedges, Diapensia, arctic poppy, mountain avens, mountain sorrel, river beauty, moss campion, bilberry, and arctic white heather. The conditions here are far too severe for reptiles and amphibians to survive, and insects are also rare in the region. Muskoxen and barren-ground caribou are the only well-built herbivores in this environment, while polar bears and the arctic wolf are the only well-built carnivores to be found in the region. Smaller herbivores include the arctic hare and the collared lemming. Arctic foxes and stoats are some of the smaller carnivores found in the region. Marine mammals include narwhals, beluga whales, walrus, and ringed and bearded seals. The furry-legged rock ptarmigan is a widespread bird in this desolate region. Typical birds of prey include the gyrfalcon and snowy owl. Some of the more widespread shore and seabirds are the thick-billed murre, black-legged kittiwake, ruddy turnstone, red knot, black guillemot, widespread ringed plover, little ringed plover and northern fulmar. Songbirds found in the Arctic Cordillera include the hoary redpoll, common redpoll, snow bunting, and lapland longspur. The snow goose, common and king eider, and red-throated loon are some species of waterfowl that live in the region. The Arctic Cordillera is one of Canada's most inhospitable climates. During winter, the temperature is nearly -35°C (-31°F) and it is very dark and long, while it is somewhat milder and more humid in the southernmost portions of the cordillera. Only about 1,050 people live in the region, found primarily in the communities of Clyde River and Qikiqtarjuaq (formerly known as Broughton Island). Most of the people who live in the region survive by hunting, fishing, and trapping. Tree stumps were discovered in 1985 on Axel Heiberg Island dating back 40 million years, indicating this northerly part of the cordillera was warmer and wetter than its present-day climate. With expected climate change (global warming), the biodiversity of this ecozone would likely increase. As the average temperature rises, more species would be able to inhabit this formerly cold and barren location. Since the currently limited biodiversity of the Arctic Cordillera is largely due to its cold climate and conditions, the effect of climate change will likely cause the biodiversity to increase dramatically as well. Also, the melting of ice and glaciers will make room for more species of plants to thrive, as well as cause the appearance of fungi species. However, while this predicted melting of its glaciers will be beneficial to the Arctic Cordillera's biodiversity, it will only increase the world's sea level and consequently submerge low-lying nations in other parts of the world. Therefore a seemingly positive effect has its downside as well. Adam Range: On central Île Vanier. Baffin Mountains: Along eastern Baffin Island. Blackwelder Mountains: On eastern Ellesmere Island. Blue Mountains: On eastern Ellesmere Island. Boulder Hills: On northern Ellesmere Island. British Empire Range: On northern Ellesmere Island. Bruce Mountains: Along eastern Baffin Island. Byam Martin Mountains: Bylot Island. Challenger Mountains: On northeastern Ellesmere Island. Conger Range: In southern Quttinirpaaq National Park, Ellesmere Island. Cunningham Mountains: On southern Devon Island. Douro Range: On northwestern Devon Island. Everett Mountains: West of Frobisher Bay, Baffin Island. Garfield Range: On northern Ellesmere Island. Geodetic Hills: On central Axel Heiberg Island. Grinnell Range: On northwestern Devon Island. Grogan Morgan Range: On northern Bathurst Island. Haddington Range: On northwestern Devon Island. Hartz Mountains: On northern Baffin Island. 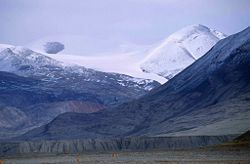 Inglefield Mountains: On southeastern Ellesmere Island. Innuitian Mountains: On Ellesmere Island, Axal Heiberg Island, Bathurst Island, northeastern Devon Island and Île Vanier. Jeffries Range: On northern Bathurst Island. Joy Range: On southeastern Axal Heiberg Island. Krag Mountains: On north-central Baffin Island. Krieger Mountains: On northern Ellesmere Island. Osborn Range: On northern Ellesmere Island. Precipitous Mountains: On north-central Baffin Island. Prince of Wales Mountains: On central Ellesmere Island. Princess Margaret Range: On central Axal Heiberg Island. Sawtooth Range: Between the Posheim Peninsula and Wolf Valley on Ellesmere Island. Selamiut Range: On the northernmost tip of Labrador. Scoresby Hills: On eastern Bathurst Island. Stokes Range: On northern Bathurst Island. Swiss Range: On central Axal Heiberg Island. Thorndike Peaks: On southern Ellesmere Island. Torngat Mountains: On the northernmost tip of Labrador. Treuter Mountains: On northern Devon Island. United States Range: On northern Ellesmere Island. Victoria and Albert Mountains: Along eastern Ellesmere Island. White Triplets Peaks: On central Axal Heiberg Island. ↑ Canadian Mountain Encyclopedia. Barbeau Peak Retrieved July 20, 2008. ↑ 2.0 2.1 2.2 2.3 Environment Canada. Arctic Cordillera Ecozone Retrieved July 20, 2008. ↑ Oceandots.com.Ellesmere Island Retrieved July 20, 2008. ↑ Robert McGhee. Arctic History Canadian Museum of Civilization. Retrieved July 20, 2008. ↑ Environmental News Network. Northern Canada Ponds Drying Up Retrieved July 20, 2008. ↑ Andrew C. Revkin. December 30, 2006. "Arctic Ice Shelf Broke Off Canadian Island" New York Times. Retrieved July 20, 2008. ↑ Martin O. Jeffries. April 11, 1985. Ice Island Calvings and Ice Shelf Changes, Milne Ice Shelf and Ayles Ice Shelf, Ellesmere Island, N.W.T.. Arctic 39 (1) (March 1986) Retrieved July 20, 2008. ↑ G. Hattersley-Smith, G. 1963. "The Ward Hunt Ice Shelf: recent changes of the ice front." Journal of Glaciology 4:415-424. (1963). ↑ Vincent, W.F., J.A.E. Gibson, M.O. Jeffries. Ice-shelf collapse, climate change, and habitat loss in the Canadian high Arctic. Polar Record 37 (201): 133-142 (2001) Retrieved July 20, 2008. ↑ Michon Scott. January 20, 2004. Breakup of the Ward Hunt Ice Shelf NASA Earth Observatory. Retrieved July 20, 2008. ↑ BBC News. December 29, 2006.Huge Arctic ice break discovered Retrieved July 20, 2008. ↑ University of Rochester, Department of Earth & Environmental Sciences. July 1999. Chris's Travel Log Retrieved July 20, 2008. ↑ S.M. Johns, H.H. Helmstaedt, and T.K. Kyser. May 13, 2004. Volcanology and geochemistry of the Bravo Lake Formation, Baffin Island, Nunavut. St. Catharines Technical Program. Retrieved July 20, 2008. ↑ Sheldon Modeland. Paleoproterozoic mafic magmatism in central Baffin Island Natural Resources Canada. Retrieved July 20, 2008. ↑ ParkWardens.com. A Land Frozen in Time Retrieved July 20, 2008. Chernoff, M. N., H. R. Hovdebo, and J. Stuart-Smith. 1972. Eastern Canadian Cordillera and Arctic Islands An Aerial Reconnaissance. Ottawa: 24th International Geological Congress. Geological Survey of Canada. 1998. Cordillera and Pacific Margin Interior Plains and Arctic Canada. Geological Survey of Canada Current Research, 1998-A. Hall, John K. 1970. Arctic Ocean Geophysical Studies The Alpha Cordillera and Mendeleyev Ridge. Palisades, NY: Lamont-Doherty Geological Observatory, Columbia University. Walker, Edward R. 1961. A Synoptic Climatology for Parts of the Western Cordillera. Montreal: McGill University. This page was last modified on 29 October 2012, at 19:14.